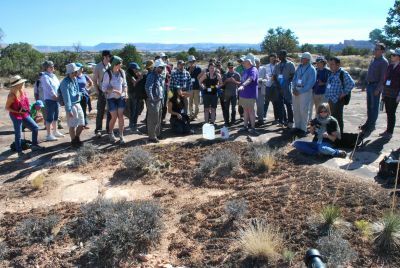 I had the pleasure of attending the Biocrust3 conference this week organized by Matt Bowker and my former postdoc advisor Sasha Reed. 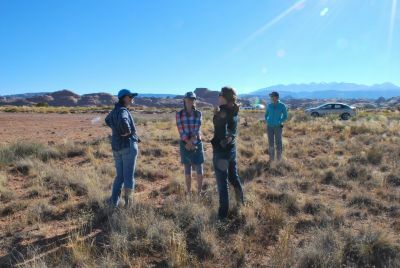 I shared data from our automated CO2 chambers that are set up in a climate change experiment outside of Moab, focusing on reiterating some of the results of our published study and presenting some fun new data as well. The automated chamber system, constructed and maintained by Ed Grote and overseen by Jayne Belnap and Sasha Reed has provided an unprecedented view of C balance in biocrust-dominated systems, and I tried to share some of my enthusiasm for the approach during my talk at the meeting. Dr. Jayne Belnap, the world’s foremost expert on biological soil crusts, sharing some of her favorite crusts. Besides getting the chance to share some of my work with the perfect audience, some of the other highlights of the conference included an overview of the new edition of the definitive reference on biocrusts, Biological Soil Crusts: An Organizing Principle in Drylands by its lead editor Bettina Weber; a retrospective by Jayne Belnap on her inspiring career devoted to studying biocrusts; and a large number of students and other early career scientists presenting an impressive array of cutting edge approaches to the next generation of biocrust research. One especially fun talk was by Tadd Truscott, the PI of the “splash lab” on the microscopic adaptations to water uptake in the common biocrust moss Syntrichia caninervis. The other plenary talks were also top notch, including Fernando Maestre’s work on biocrusts and distributed dryland experiments, and Trent Northen’s talk on omics approaches to biocrusts and other soil ecosystems. A closeup of Syntrichia from the Splash Lab. With 150 attendees, it’s obvious that biocrust research has recently grown in volume and scope. Biocrust3 highlighted several areas in which amazing progress is being made. These areas included genetic analyses of cyanobacteria and other biocrust components, a huge push toward understanding biocrust restoration, and a deepening understanding of the identities and functional purposes of the diverse components–cyanobacteria, heterotrophic bacteria, fungi, algae, mosses, lichens, and more. Leading the pack here was our postdoc for the fungal loop project Eva Dettweiler-Robinson who presented findings from her fungal loop work that has laid the foundation for our new project on the topic. Perhaps the most fun part of the conference for me was that it was a chance for a team that we have been assembling for our fungal loop project to come together for the first time. Through shared lodging and several field expeditions this week, we had a chance to get to know each other as well as scope sites for the project and scheme and plot about the discoveries we want to work toward. I sense that this is the kind of team that will be able to not only accomplish our project objectives but take on a life of its own. See you at Biocrust4! Hey there Anthony! Cool stuff on the bio crusts…And long time no talk! I just visited the Moab area and was mountain biking past such areas and making sure not to venture off the trail. I’m also assisting with a research project on lichen diversity and distributions in alpine tundra of Rocky Mountain National Park, which we hope to publish this Spring, and have been thinking a lot about the functions of these organisms which have been considered ‘trash’ or un-influential in the past. What a great study system you’re involved with. Dave, so great to hear from you. I just noticed this on here! Glad to hear you are still involved with science and I hope you and your family are doing great. If I roll through Denver I will let you know! I would love to catch up.